Ever since we took a trip to Disney World earlier in the year, Big Sister E's love for Mickey Mouse has increased a few notches. She was easily a fan before we went ("We're going to Mickey Mouse's house! We're going to his houssssse!") but since we returned, the excitement over most anything Mickey was at an all-time high and has remained that way. 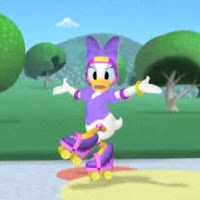 So when we heard that Walt Disney Studios Home Entertainment's all-new, full length adventure Mickey Mouse Clubhouse: Road Rally was premiering on September 7, 2010 on the Disney Channel at 7:00 pm ET/PT, I wasn't surprised that Big Sister E was eager to see it. As it turned out, she didn't even have to wait until today to get her first viewing and I'm not sure she could have been happier about it. 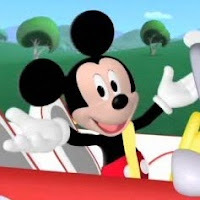 In Mickey Mouse Clubhouse: Road Rally, Mickey and the clubhouse gang embark on a cross-country race that takes them over mountains, through deserts and into jungles when they decide to participate in the first annual Road Rally. Riding in a car or train or on a bike or roller skates (or more), the pals follow a map to four specific stops where they have to find hidden "Mickey Markers" and uncover clues. But what entertaining race would be complete without a few problems along the way? From breakdowns to a broken bridge to a mountain of rubber duckies, the Clubhouse gang learn that even throughout a competition, the most important thing is to help your friends and have fun. 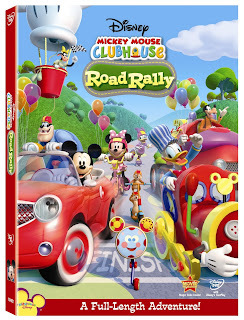 For a unique twist that we really enjoyed, Mickey Mouse Clubhouse: Road Rally can be watched in three different ways. As well as the traditional FastPlay (just sit back and watch the show), this DVD features two Discovery Modes for fun, interactive learning during the movie. In Discovery Mode 1, for ages 2-3, we were able to use our remote control to answer questions about colors, shapes and sizes. In Discovery Mode 2, the questions were a little more challenging and are appropriate for ages 4-6. With so many shows and movies that claim to be for kids but then feature violence, characters that dress inappropriately or use language I would prefer my daughters not repeat, Mickey Mouse is a welcome change. This movie is cheerful and engaging and even if kids only think they are being drawn in by the bright colors and classic animation, they will also be learning pre-reading skills, colors, shapes, counting, identifying differences and building their memory. This movie is also full of positive messages and reminders to kids about things like sportsmanship, helpfulness, empathy, responsibility, resourcefulness, problem-solving, patience and all of the wonderful benefits of being a good friend. As the characters have to work together to complete tasks, the Road Rally as a whole is noncompetitive and a good time for everyone. All of that from one 74 minute movie? That's why Mickey Mouse is the star that he is! Retailing for $26.99, Mickey Mouse Clubhouse: Road Rally is available now from Walt Disney Studios and don't forget to tune in tonight at 7 pm ET/PT on the Disney Channel for the big movie debut! Mickey Clubhouse is the best. Zoe is a huge fan, so we're definitely gonna have to pick this one up! Sounds great! Kaelyn loves Mickey Mouse Clubhouse! My kids love mickey! I am following you from follow me back Tuesday!